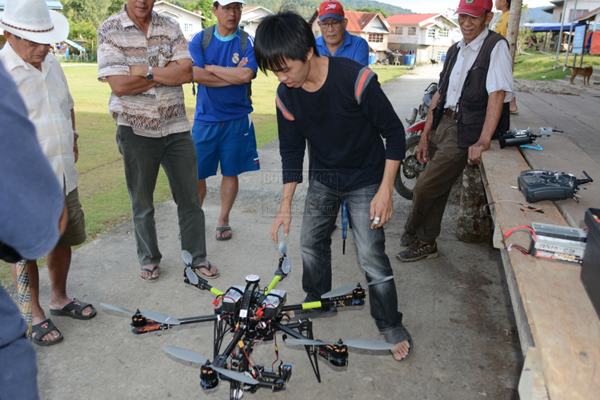 UNMANNED AERIAL VEHICLE: Sean Chai of Santumn Enterprise with the helicopter. 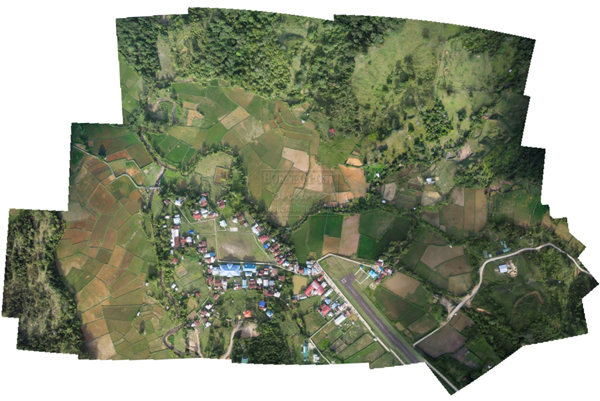 INNOVATIVE ICT APPLICATION: A Ba Kelalan photo-montage map. 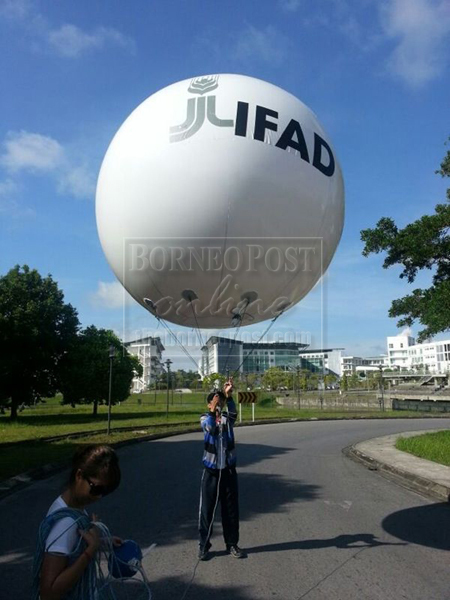 LOW-COST: Unimas campus trials with the helium-filled balloon. KUCHING: Rural communities are showing increasing interest in grassroots initiatives to develop maps of their territories. In a statement yesterday, a visiting professor from the Institute for Social Informatics and Technological Innovation at Universiti Malaysia Sarawak (Unimas) Dr Roger Harris said in a recent Global Conference on Community Participatory Mapping on Indigenous Peoples’ Territories held in Samosir, North Sumatra, indigenous groups from countries including Malaysia, Nepal, Panama, Mexico and Brazil, explained how they had adopted affordable, high-tech mapping technology to retrace the history of their land ownership and to catalogue their natural resources. He said in Sarawak, eBario Sdn Bhd, the organisation that operates the multi-award-winning eBario telecentre, has initiated the eBario Innovation Village Project as a living laboratory to incubate innovative grassroots applications of Information and Communication Technologies (ICTs) capable of stimulating development within Malaysia’s isolated rural and indigenous communities. In partnership with Universiti Malaysia Sarawak (Unimas) and with funding support from the International Fund for Agricultural Development (IFAD), the project is testing low cost aerial photography for community mapping, using digital cameras attached to tethered helium-filled balloons and radio-controlled model airplanes. “The resultant photographs are stitched together by computer to form an aerial view covering a wide area which is then geo-tagged with global positioning co-ordinates to form detailed maps. “Such maps can be used for a range of applications including land-use planning, claims for land rights, eco-tourism, development of agriculture, hydrology, animal migration plotting, indigenous knowledge inventories, environmental surveillance, documentation of climate change impacts, dispute resolution, road mapping, forest management and cataloguing of cultural sites. Low cost technologies and the skills to use them bring these applications within the reach of grassroots communities,” he said. The eBario-Unimas team is working with Sean Chai Ching Loong of Santumn Enterprise, a local firm that specialises in aerial photography with unmanned aerial vehicles (UAVs). Using both helium-filled balloons and UAVs, the team has begun to generate high-quality photo-montages that form the basis of detailed maps. This month, the team visited Ba Kelalan in the highlands of northern Sarawak to test their approach in the field. Community representatives expressed their interest in the results and have asked the team to return to extend their coverage into surrounding areas. “Detailed maps are generally not available to the general public, or they are either prohibitively expensive or insufficiently detailed for the purposes that rural communities would wish to use them. “Modern maps are based on aerial photographs but with low cost technologies and contemporary computer software, rural folk need not be excluded from their use. Actually, aerial photographs provide a truer representation of reality than even the most detailed maps,” he explained. As more ICTs become available to Malaysia’s rural communities, and especially to those in isolated and remote locations, as with the eBario initiative and its sister projects in Ba Kelalan and other locations, so the residents can be facilitated towards more activities which they themselves prioritise and which cater to their specific needs.